(8–0) MISSISSIPPI STATE 45, (5–5) Tennessee-Martin 14: Easiest pick on the board. Both teams have played Kentucky. The Bulldogs won 45–31, while the Skyhawks were ripped 59–14. (8–0) FLORIDA STATE 35, (4–5) Virginia 17: No one really knows what kind of performance Jameis Winston and the Seminoles will give on a week-to-week basis. So far, it’s been enough to keep the streak going. (7–1) AUBURN 38, (6–3) Texas A&M 17: The Aggies finally stopped their free-fall last week, but the 21–16 victory over Louisiana-Monroe didn’t impress anyone. Auburn’s dual-threat QB Nick Marshall has an outside shot at the Heisman Trophy as long as the Tigers keep winning. (8–1) Oregon 31, (6–2) UTAH 27: The Utes have played five conference games so far, with two going to overtime and the other three decided by an average of two points. Oregon is good enough to get by them on the road, though. 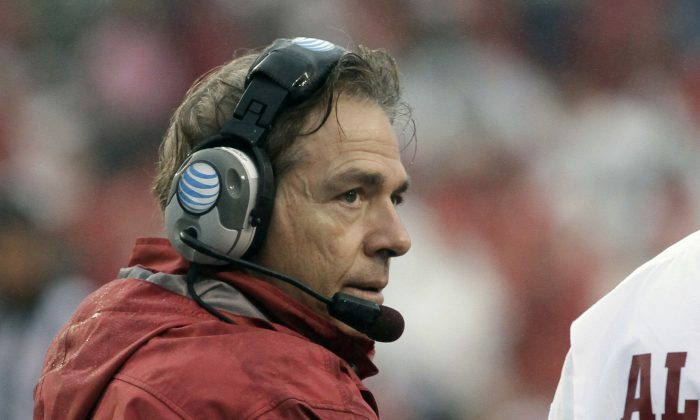 (7–1) Alabama 17, (7–2) LSU 13: Whenever Nick Saban comes to Baton Rouge, tensions run high. This weekend should be no different, but the Tide is finally on a roll. (7–1) TCU 38, (7–1) Kansas State 34: Both teams edged Oklahoma, both ripped Oklahoma State, and both embarrassed Texas Tech, so we’re going with the home-field advantage here. (7–1) Ohio State 28, (7–1) MICHIGAN STATE 24: There are some good games on the schedule, but this might be the best with a possible playoff appearance on the line. Here’s betting that the Buckeyes get revenge for last year. (7–1) ARIZONA STATE 34, (7–1) Notre Dame 28: Notre Dame’s defense allowed just 12.0 points per game through their first five contests, but now have given up 37.7 in the three games since. (7–2) OLE MISS 49, (5–4) Presbyterian 7: No matter how dejecting it was for Ole Miss to lose on such a close play last week while also seeing their top receiver go down, the Presbyterian Blue Hose pose no challenge whatsoever this Saturday. (6–2) OKLAHOMA 35, (7–1) Baylor 30: Another close call here, but the Sooners, at 3–2 in the Big 12, have too much pride to lose again and fall out of the conference race altogether. (7–2) UC-Los Angeles 34, (6–3) WASHINGTON 20: New Huskies coach Chris Peterson has struggled against the upper echelon of the Pac-12 so far, with losses to Stanford, Oregon, and Arizona State. It seems likely they’re not ready for the Bruins and dual-threat QB Brett Hundley. (6–2) ARIZONA 41, (2–7) Colorado 14: The woeful Buffaloes are winless in the Pac-12 (0–6) and haven’t won a road conference game since 2012. (6–2) Georgia 38, (5–4) KENTUCKY 20: Though Georgia has had to play without suspended star RB Todd Gurley, the last three games (and this weekend as well) his replacement, Nick Chubb, has averaged 167 rushing yards per game in his absence. (7–1) Duke 24, (3–6) SYRACUSE 23: The Orange have lost six out of their last seven, while unheralded Duke is tied for the fifth-best record in the NCAA, although their last three wins have all been by single digits. (4–5) TEXAS 28, (6–3)West Virginia 24: The Longhorns haven’t had too much to cheer about this season, but they seem poised to pull the upset this Saturday against a Mountaineers defense that allows 25.7 points per game—62nd in the nation. (7–2) Georgia Tech 38, (5–4) N.C. STATE 28: Although the Wolfpack has a respectable record, their wins have come against Georgia Southern, Old Dominion, South Florida, Presbyterian, and Syracuse—not exactly murderer’s row. (6–2) Wisconsin 41, (3–6) PURDUE 21: Wisconsin’s Melvin Gordon is fourth in the NCAA in rushing at 1,296 yards, while Purdue is 86th out of 124 teams in rushing defense, giving up 177 yards per game.